Guest post from Jan Johnsen, author of the new book Heaven is a Garden and my co-contributor over at Garden Design magazine. Yoga and gardens are a natural fit! Both are very personal endeavors – Yoga practice elevates our sense of wellbeing and makes us more aware of the present moment while gardens encourage us to appreciate the ‘now’ as we inhale the aroma of flowers or the green atmosphere after a quiet rain. When you put the two together and create an outdoor space where you can practice Yoga in a meditative garden, it is joyful, indeed! Gardens are a simple way to celebrate our time with Nature in our own individual way. Some of us thrill to a garden filled with flowers, in colorful bloom all summer. Others yearn to be in a quiet, simple space, with rocks and trees sighing in the breeze. Whichever type of environment speaks to you, it can become a Yoga garden where you face the morning sun and breathe in deeply. Here are a few ideas that you can use to make your outdoor space a serene yoga garden. Add statues or sculptures that add a feeling of serenity to the space. 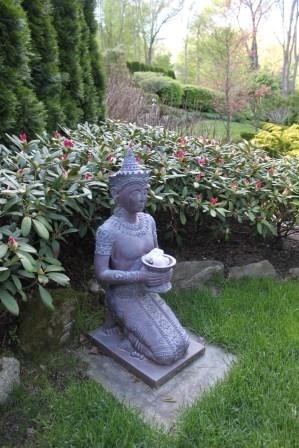 Here I placed an Indonesian figure with crystals in an offering bowl on a stone paver and planted ‘Yaku Prince’ rhododendron as a backdrop. Backdrops of any kind are very helpful in displaying an artwork. This is a sweet way to set the tone for a Salute to the Sun in the morning. 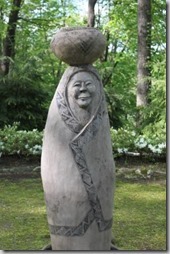 But the style of the sculpture you choose for your Yoga garden does not have to be Asian. Here is a very different art piece with a Southwestern flair. It is a different look but the calming atmosphere it helps to create is similar. The bowl on her head is actually an overflowing , recirculating fountain. Astilbe ‘Deutschland’ – this shade-loving perennial, a mainstay of woodland gardens, comes back every year with feathery flowers that look great in a mass in May and June. After they finish blooming I leave the flower heads on for the effect. 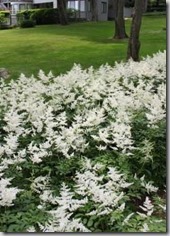 I follow this up with Astilbe ‘Vision in White’ which blooms later and continues the white lacey display. 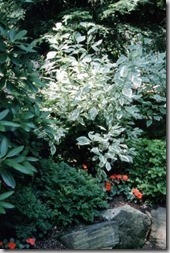 Variegated Red Twig Dogwood (Cornus alba ‘Elegantissima’) is a great shrub that adds a bright spot in the yard with its gray-green leaves with a white margin. This looks lovely tucked in among other bushes. ‘Lucky White’ Lantana – I love white lantana flowers although I realize that in very temperate zones lantana can become invasive and may be seen as a noxious weed. Where I live, it is an annual and I like ‘Lucky White’ lantana for its clean, bright flowers, flecked with yellow. 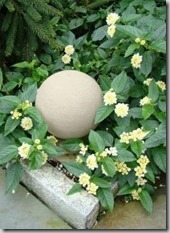 A nice touch, as shown here, is to plant it around a cast stone ball finial. Perhaps the most important requirement for an outdoor yoga space is shade. We all want a sweet, cool spot to be outside and if we have light, dappled shade from overhead trees or an arbor, we can enjoy it all the more. 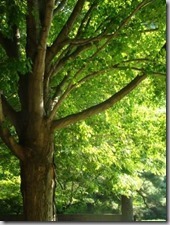 If you have a tree with heavy shade or low hanging limbs, you can create filtered shade by removing a lower branch. This is called ‘lifting the canopy’. 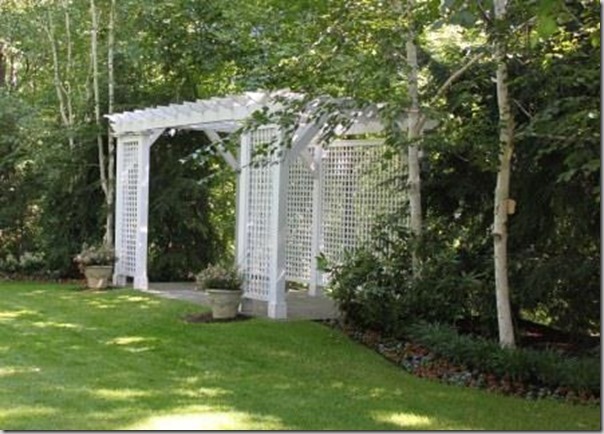 Another shady idea is an arbor nestled among trees, as shown, where you can place a mat and practice alone. Here again, the color white adds a clean, serene feeling to the setting. Water, of course, is captivating addition to any garden! The sound alone is soothing and can aid in reflection and contemplation. A recirculating fountain can be the perfect accompaniment to your yoga time outdoors. 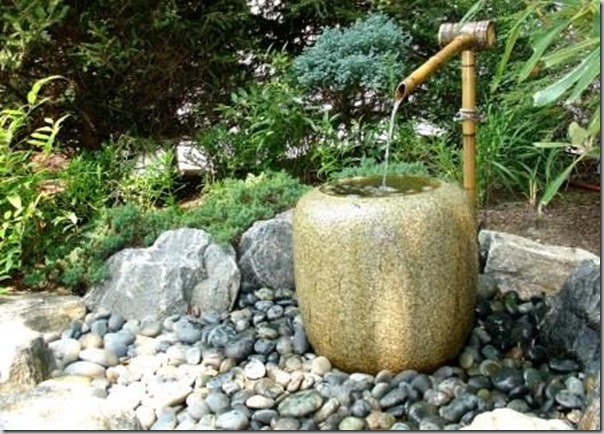 Here water trickles over a Japanese style basin and recirculates back through the bamboo spout. I hope these tips and photos inspire you to create a yoga garden! I discuss these ideas and many more in my new book, ‘Heaven is a Garden – Designing Serene Outdoor Spaces for Inspiration and Reflection’ ( 2014, published by St. Lynn’s Press). If you enjoyed this post, check out more of Jan Johnsen’s insights on her blog, Serenity in the Garden, and in her book, Heaven is a Garden. Angela’s Garden has kindly offered to celebrate the release of Jan’s new book with a generous giveaway – a matched set of her indigo gardening gloves and kneeling pads! I’ve been using her kneeling pads for some years for light-duty gardening such as weeding and veggie gardening, and – coincidentally – for yoga, to prevent my knees hurting when I’m kneeling on the hard ground. They’re soft and comfortable, and would make maintaining your meditative yoga garden even more fun. Congrats to Bobbi Jean, our winner of the Angela’s Garden set of gloves and kneeling pads!! Jan Johnson is my muse. I knew about plants and gardening, but she has opened a new world to me with her landscaping. I ordered this book but havent read it yet. I agree that some gardens have that special aura that truly makes you relaxed, while other gardens are just nice outdoor spaces. Exactly, Heleene! it is an aura of sorts….happy plants can actually make a garden feel wonderful. I say that you can feel a garden ‘sing’ when the plants are well cared for. Like when you water them with compost tea. I love to practice yoga. I just wish that I live in a climate that it can be practiced outdoors more often! Seattle can be a challenge. What really made our gardens fun a few years ago …added perennials for an ever-changing view through the seasons. It drew my husband into gardening alongside me because he likes the uniquely shaped flowers or foliage that seemed to pop up out of nowhere. We laugh together as he describes what he saw out in the yard & I try to figure out which plant he’s referring to. For example, “seahorse lips” described Primrose Miller’s Crimson & dinosaur leaves were hosta. He’s learning plant names and I’m making up nicknames to help him remember them, so we have less of these nightly conversations where I am guessing & he’s describing. After over 25 years of marriage we’re both learning something new. Corrine, sounds like you have a fun time ! I love blue flowers in a garden! I’ve been planting blue morning glories for the past few years. I also love yoga but I haven’t tried it outside yet. What a lovely giveaway! I have just started m yoga journey. Thanks for the peaceful garden tips! Garden gloves and knee pads are my friend in the yard for this 57 year old. I can’t hardly do without them, and I can sure go through some. What a lovely site you have and thank you for the information and opportunity to win. Ah, delightful! Much inspiration & loveliness. Hmmmm – Outside, in the garden watching the bees work, wild turkeys chattering to themselves – this IS a little piece of heaven on earth. What a blessing! 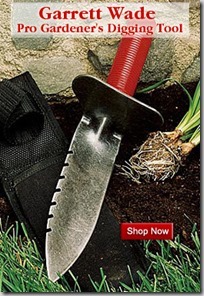 Gardening is my absolute favorite activity, and I could really use the knee pads for weeding my garden. Knee pads and gloves ….a very sweet giveaway, and items I would surely get a lot of use out of! I’ve already put in three new flower beds this spring and am just getting started! I am fortunate to have a beautiful and serene backyard thanks to my husband’s hard work. Your tips were very timely as we just made some additions and I am excited to create a yoga space. Thank you! I hope your husband is inspired as well! Thanks…. Two things that I love dearly are yoga and gardening. Both so very good for the heart, mind and spirit. Debra – gardens and yoga are a natural fit! I visited the Japanese garden at the Chicago Botanic Garden over 10 years ago and I still remember how beautiful it was, even in March. If you have good “bones” in your garden, it looks amazing year round. Thank you for this advice on building a garden that could be built around my meditation practice. This is a great stepping stone for me to design upon. Thank you for contributing to all of our lives with this article. I am a twice a day meditator, and I wish all would practice this art. The world will be happier when we all do! Lisa Harris – keep on doing what you do! and I agree with you about meditating for all…. really enjoy your site. Working on a dry/seasonal stream at present; thanks for the give-away! 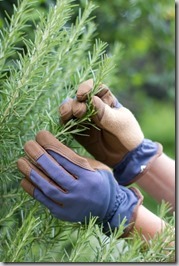 I love to garden a need a new pair of gloves. Thanks. Your article inspired me to create a garden space for yoga this summer. The specific suggestions you make will be very useful. 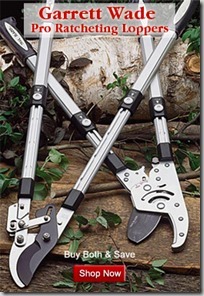 I’m just starting to get into gardening, these would be such wonderful accessories to have! I love the lavender color. Thanks! Great post! I love Jan’s new book and it expanded my knowledge on history and reasons behind design ideas. Make a garden that invites you out into it so you can be in nature is the best kind of garden to me. hi Laurin! Thanks so much for all your support! You made a really good point about how plants can add to the landscaping for my yoga garden. It seems like they can soften my yard to make it appear more relaxing by adding a natural element. I liked your suggestions for plants that would be nice to add to a yoga garden. Astilbe Deutschland seems like it would be a lovely addition to any garden with its feathery flowers that blossom in May and June. Thanks for posting this! These are some great tips, and I appreciate your advice to use a lot of white plants when designing a yoga garden in your landscape. I’ve taken up yoga, and I think it would be really nice to have a peaceful outdoor area to do that in. I’ve always found white flowers to be calming to me, so I’ll definitely look into planting a lot of those. Thanks for the great post!